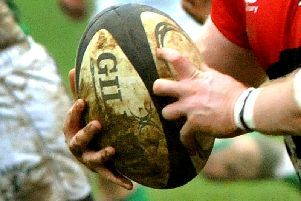 Bletchley Ladies’ Intermediate Cup run came to an abrupt end at the third round stage as they went down 41-17 to Supermarine Ladies at Manor Fields. Despite two Caroline Collie tries, Supermarine proved too strong and booked their spot in the fourth round. Eight minutes into the game, Supermarine took the opening points; initially they knocked on from the opening kick, but the referee played advantage and had just called it over when Bletchley knocked on. Supermarine won the ensuing scrum, passed out and then kicked; the ball went straight out, moving the line out back level with the kicker. Bletchley then lost the line out, but forced a knock on after a few phases of play. They won the scrum and kicked up the pitch. Supermarine caught it on the bounce, worked back up to the halfway line, then knocked on. Bletchley secured possession and moved back towards the Supermarine line, helped along by a penalty from the visitors, which they then didn’t retire 10 for. However, a couple of phases on, Supermarine ripped the ball from a Bletchley ruck and capitalised on a Bletchley penalty, that followed soon after, with a try to put them 5-0 up. Four minutes later, Bletchley took the lead with a try from Caroline Collie between the posts; Bletchley had won a scrum and kicked up the pitch. Supermarine missed the catch on the bounce and Collie gathered the ball on the 22 and ran it in; it was then sweetly popped through the posts by Rachael Taylor to put Bletchley 7-5 up. Five minutes later, Bletchley did it again with a similar move. Supermarine secured a scrum and passed the ball out, on the second pass the player dropped the ball; Bletchley picked it up, passed out to Collie who used a great hand off to move past the opposition and made a break for the line to extend their lead to 12-5. Both teams had the bit between their teeth, and it was the best part of quarter of an hour before the next points went on the score sheet. The play moved from one team to the other, with each capitalising on the smallest of mistakes from the opposition, but eventually Supermarine took the upper hand and worked towards the Bletchley line. Their first attempt from a Bletchley penalty was held up, but they secured the ball from the back of the 5m scrum, drove forward, passed out and put it down over the line as the player was grounded in a tackle; 12-10. The remaining few minutes of the half yielded no further score. Having ended the first half just ahead, this very quickly changed for Bletchley. Just two minutes in the second half, Supermarine put the ball down between the posts. A clean boot followed, moving them 17-12 ahead. Five minutes later, Supermarine opened the gap still further, with another converted try for 24-12. Despite Bletchley’s best efforts, and a dogged fifteen minutes, the third try of the half went Supermarine’s way too, opening the gap to 31-12. It didn’t help Bletchley’s cause that Supermarine’s kicker had now found her boot too! Bletchley continued to battle, and at least make Supermarine work. They dug in and defended strongly for the remaining quarter of an hour; it looked like this might be the final score, but in the closing play of the game, Supermarine managed to work a knock on from Bletchley to their advantage. They took the scrum on the 22, passed out, put on a big shove, then passed out again. another couple of phases recycling the ball, they put on a final big shove and took the ball over the Bletchley line. final score: 41-17 and Supermarine continue to the next round of the cup.